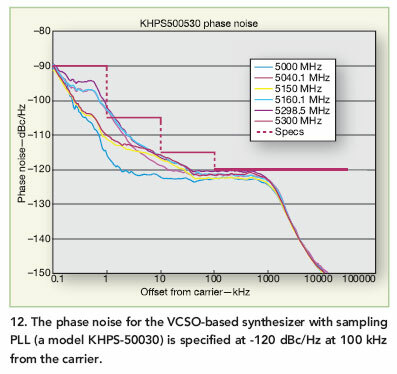 A synthesizer using a VCSO within a multiple-loop architecture (model KHPS-50030) was implemented in a module measuring 200 x 120 x 30 mm (Fig. 1). It tunes from 5000 to 5300 MHz in 100-kHz steps and provides output signals at levels to +15 dBm with output flatness of ±3 dB across the tuning range. It settles to a new frequency in 20 ms or less and exhibits harmonic levels of -15 dBc or better and spurious levels of -60 dBc or better. 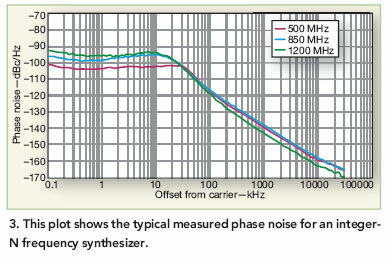 The phase noise is -105 dBc or better offset 1 kHz from the carrier, -115 dBc/Hz or better offset 10 kHz, and -120 dBc/Hz or better offset 100 kHz. It works with an external 10-MHz reference oscillator or, alternately, can be supplied with an internal 10-MHz oven-controlled crystal oscillator (OCXO) reference source. It is designed for a +12-VDC supply and operating temperatures from -10 to +60°C. 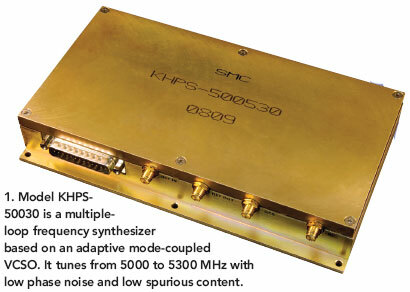 Designs using this technique of a coupled resonator and adaptive synthesis have already achieved time-domain performance of better than 6 fs and frequency domain performance of 152 dBc/Hz offset 10 kHz from a 1-GHz carrier. Multiloop synthesizer architectures with direct-digital synthesizers (DDSs) have been used for tuning resolution better than 1 Hz. Figure 5shows a dual-loop synthesizer where a DDS module combines with a conventional PLL synthesizer. The DDS clock is fed by a selectable frequency synthesizer which provides a fixed set of frequencies based on the parallel select lines. Unfortunately, the DDS approach can generate high spurious output levels. But these spurs can also be predicted and shifted by proper choice of clock frequency. If spurious products fall within the loop bandwidth, by switching the clock frequency, the spurs can be shifted to a band where they can be attenuated. 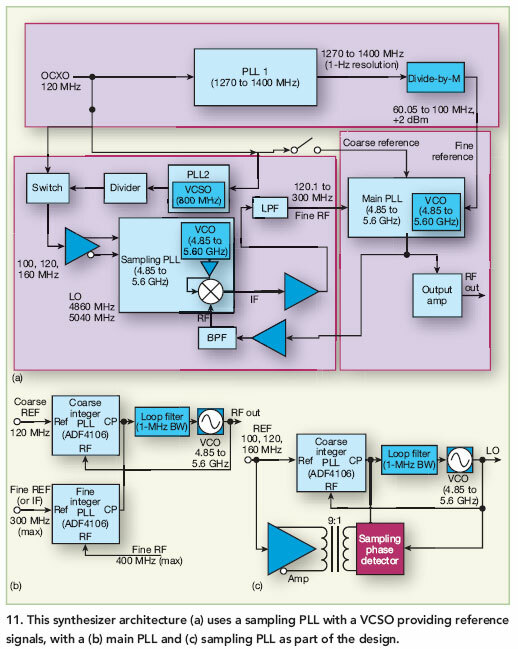 In this dual-loop approach, the output synthesizer�s PFD can be high to improve phase noise while still delivering 1-Hz resolution with a 10-MHz reference. 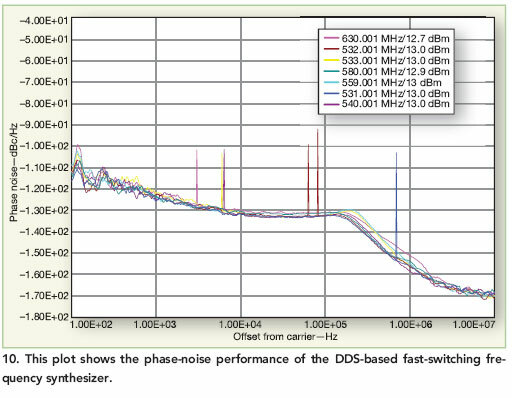 Spurious levels are typically better than -70 dBc from 1100 to 2500 MHz with 1-Hz step size, better than 1-ms switching speed, and low phase noise (Fig. 6). 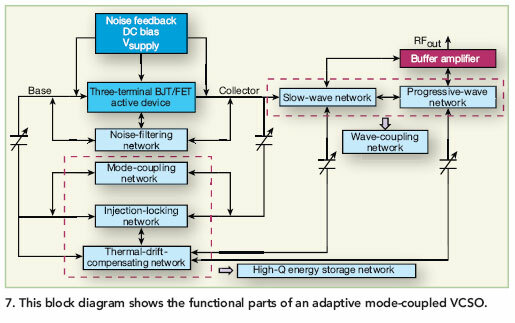 Figure 7shows a typical block diagram for an adaptive mode-coupled VCSO optimized for low noise with vibration, whileFig. 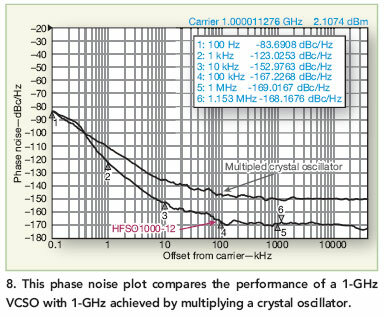 8compares its phase noise at 1 GHz to that of a multiplied crystal oscillator. An adaptive mode-coupled VCSO combined with a digital PFD can be used to form a low-cost, low-power synthesizer module. The digital PFD has a wide capture range, although with high noise floor. An analog PFD has lower noise floor, but narrow capture range. To create a low-noise synthesizer with a wide capture range, a digital PFD can be used in parallel with an analog phase detector. The digital PFD is used for initial acquisition, and the analog detector for final tuning. 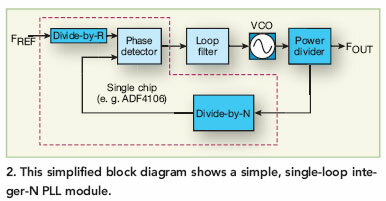 Within a DDS architecture, the VCSO can be used to create a synthesizer (Fig. 9) with fast switching speed (about 200 µs). The DDS is used as the feedback divider for high resolution and flexibility in choosing a reference frequency. 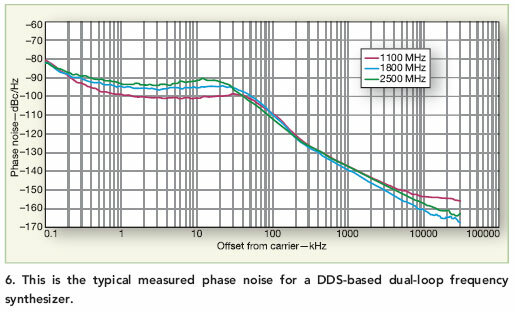 From 530 to 630 MHz, spurious levels are better than -75 dBc with low phase noise (Fig. 10). 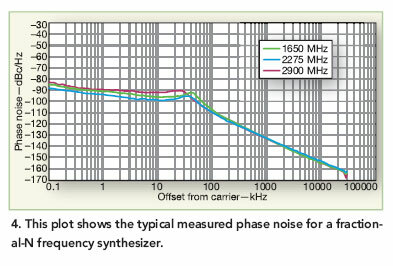 Since the analog phase detector has a low noise floor, the synthesizer bandwidth was kept large for fast switching time with low phase noise. U. L. Rohde and A. K. Poddar,” Low Thermal Drift Tunable Frequency Voltage Controlled Oscillatory,” United States Patent No. 7, 262,670 B2, August 28, 2007. P. Sotiriadis, “Intrinsic jitter of flying-adder frequency synthesizers,” in Proceedings of the IEEE International Sarnoff Symposium, 2009, pp. 1–4. P. Sotiriadis, “Timing and spectral properties of the flying adder frequency synthesizers,” in Proceedings of the IEEE International Frequency Control Symposium, July 2009, pp. 788–792. Paul P. Sotiriadis, “Theory of Flying-Adder Frequency Synthesizers—Part I: Modeling, Signals’ Periods and Output Average Frequency,” IEEE Transactions on Circuits and Systems—I: Regular papers, Vol. 57, No. 8, August 2010. Paul P. Sotiriadis, “Exact Spectrum and Time- Domain Output of Flying-Adder Frequency Synthesizers,” IEEE Transactions on Ultrasonics, Ferroelectrics, and Frequency Control, Vol. 57, No. 9, September 2010. Paul Peter Sotiriadis, “Cascaded Diophantine Frequency Synthesis,” IEEE Transactions on Circuits and Systems—I, Vol. 55, No. 3, April 2008. U. L. Rohde and A. K. Poddar, “A Digital Frequency Synthesizer Using Adaptive Mode-Coupled Resonator Mechanism for Low Noise and Low Jitter Applications,” IEEE International Symposium on Circuits and Systems (ISCAS), May 15-18, 2011, Rio de Janeiro, Brazil. U. L. Rohde and A. K. Poddar, “Emerging Technology and Market Trends for Frequency Controlled Circuits and Timing Devices,” Microwave Journal, May 2010, pp. 20-44. U. L. Rohde and A. K. Poddar, “Miniaturized VCOs Arm Configurable Synthesizers,” European Microwave Integrated Circuit (EuMiC) 2009, September 28-October 2, 2009. U. L. Rohde and A. K. Poddar, “VCOs Tune Miniature Synthesizers to 12 GHz,” Microwaves & RF, Vol. 49, No. 4, April 2009.